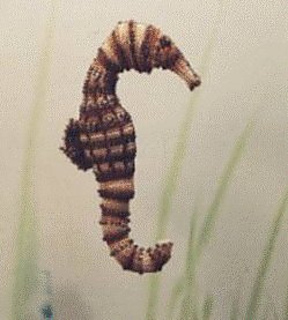 Knit from tail to head, this Seahorse is worked in one piece. 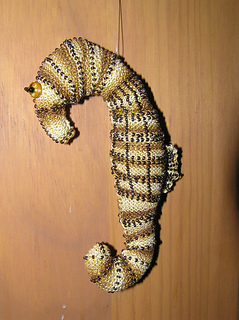 Beaded and unbeaded areas on the shaded thread body create the “sea-horsey” textures. The fin is picked up and knit directly onto the body. There is only one seam. One hank of seed beads and one ball of DMC will make two. Eyes: two 8mm topaz glass discs, 2 Sz 8 black seed beads, and 2 Sz 11 black seed beads. Instructions for transferring beads to thread and bead knitting included in pattern. Kits available from FiberSpace. Call 877-467-0382 for information.